I have had the great good fortune of working with animals my entire adult life, as a veterinarian, as an animal behavior specialist, a professional dog trainer, and through the last twenty years, an animal communicator. Obviously, the earth’s animals are an integral part of the natural world, and they embody qualities that we can benefit from deeply, if we pay attention. The animals exemplify freedom, peace, love, playfulness, warriorship, and most of all, presence. They are completely present to the moment, and this is one of the greatest teachings they have to offer us. They aren’t thinking about tomorrow or yesterday; they are fully present here and now. When they are injured or ill, you might notice that they can still be happy. How is that? It is because they are not attached to thoughts as we are. They don’t make something more than it is. They simply accept what is. I used to give a talk called Wise Old Souls in Fur Coats and Feathers. That is really how I see it. We look at these creatures in their many forms and their bodies are what we see and know. But there is another reality rarely glimpsed in our ordinary reality, and that is the domain of the soul. It is this domain that intrigues me the most, and this is where I meet them. The message that consistently comes through me from the animals is that we really are all one. When you can tap into this level of energy, it is astounding. The love is incredible, as is the wisdom. They also tell me that there is no hierarchy of souls, and that they are ready, willing, and able to work with us to restore peace and harmony on the earth. When I first started trying to communicate with animals twenty years ago, I was told and taught by other people that the only way to do this was through sending and receiving pictures. That just wasn’t working for me. After a lot of trial and error and time gone by, I realized that I had already been communicating with animals for some years. I was blessed to be able to spend time swimming with dolphins, and after that experience I was communicating with them on a daily basis through my writing. I didn’t think of them as animals; I saw them as my spiritual teachers. Eventually I realized that the easiest way for me to communicate with the animals was through writing. Whether I’m with the elephants and the whales or with peoples’ animal companions, their communication often comes through as a voice, so I channel the animal’s voices and speak for them in addition to the writing that I do. I have been in love with animals all of my life and have traveled the world for many years to some amazing places to be with animals in the wild. I have been to Africa several times, once for a year, where I was fortunate enough to be able to work with wildlife in the bush. After my last trip, in 2002, I realized that the elephants had come home with me energetically. When I asked why they were with me, they said they wanted to write a book together, which I agreed to. 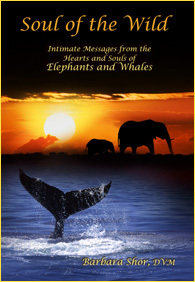 After several months of daily communication, the elephants made way for the whales to speak, and the result of that time together was a book called entitled Soul of the Wild: Intimate Messages from the Hearts and Souls of Elephants and Whales. The elephants and whales have been my guides now for many years, teaching me, loving me, and stretching me to the limits. Always holding and supporting me and letting me know that they, as animals on planet earth, have a great mission. That mission, they tell me, is one of supporting and stabilizing this planet and bringing peace and harmony to all beings. They are the glue that holds the earth together. Through their strong and clear focus, they bring an energy of peace and harmony to the earth, holding her stable and intact, through aligning their energy with the earth and all her inhabitants. The elephants on land and the whales in the sea perform similar functions. They are both enormous, physically and spiritually. And for this reason, they are an extremely powerful influence for our mother earth. They work with the energy of the earth herself, with the gridlines, which are the energy fields that extend up and around the earth, vertically and horizontally. Both the elephants and whales work with these energetic grid lines, keeping the earth stabilized and the energies grounded. In addition to creating and securing this element of harmony, they have a very strong intention for peace and understanding between all beings on the earth, and this is what they transmit as they move through the water and on the land, making their amazing sounds. 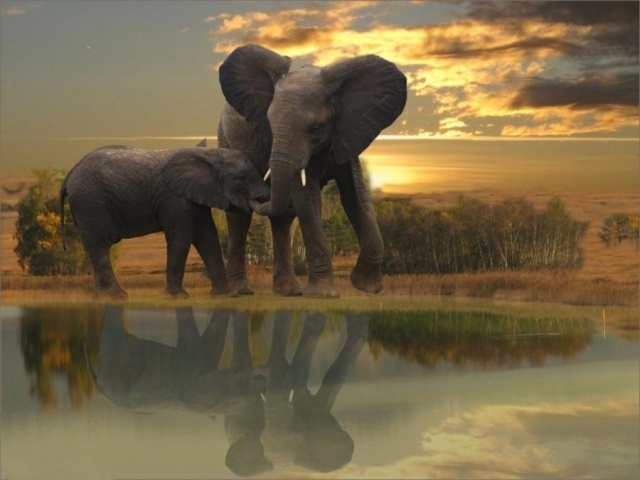 Both elephants and whales have the same capacity for infrasonic sound, below the range of human hearing, and their voices carry for miles, projecting a strong intention of peace, harmony, and well being for the planet. In this way they are similar. At the same time, elephants and whales are different. The elephants are extremely emotional beings: passionate, sometimes angry and aggressive, and incredibly compassionate and loving. And, of course, very wise. The whales are not as emotionally based. They embody space, the vast space of the deep ocean. And for this reason, they incorporate the energy of emptiness, of all creative potential, and the deep wisdom of the cosmos. They are cosmic beings. They bring forth the spirit of the void, a space of nothingness and everything, where creativity and awareness begin. They hold the capacity for teaching us about how to let go of everything we know in order to find a new way: a way of peace, understanding, full expression, and boundless creativity. Much of what I have learned from the elephants and the whales are the very same principles I’m still learning through human teachers and their writings. The main teaching that I have received from the animals is that we are all one consciousness. We hear so much talk about “we are all one” that it has almost become a cliche and lost its meaning. But the animals are telling me that this is quite true, we really are all one at the level of the soul. I’ve also learned that there is no hierarchy of souls. The whales and the elephants have told me that they are no more or less special than any other animals, whether that be an ant, spider, snake, wolf, dog, cat, horse, lion, antelope, hawk, mouse or whatever. At the level of the soul we are all the same. They’ve taught me that each being comes in with a different form that is a perfect vehicle to carry the energy for whatever their purpose is on the planet. The intention of the elephants and the whales to hold and balance and harmonize the planet is very specific, and every other animal as well has a specific purpose, which they are all perfectly adapted for. I have a tendency to think that we humans are destroying this planet and leading the earth toward some kind of terrible outcome. But the animals remain positive and hopeful, supportive and loving. They honor us so deeply as human beings—our creativity, our tremendous brain capacity, and our ability to change the face of the planet. The greatest lesson we can learn from all animals, including our companion animals, is presence. They are all absolutely and completely present. They do not live in past or future thinking, forever analyzing what is going on and why. They’re just completely present, embodying a freedom and a connection with the earth and all the natural forces, and they do so with unconditional love. Anyone who has a dog, cat or horse knows this. At the level of the soul, which is usually where I work with them, their wisdom is profound. What I’ve learned from the animals is that there is a possibility for this planet where all beings—animals, plants, people, nature spirits, angels, and fairies—can live in love, peace, and harmony. I know without a doubt that the animals hold this vision for us, and they are ready, willing, and able to help us create this. All we need to do is tune in and connect with them, and they are with us absolutely and completely as one consciousness. Their love is almost unimaginable in its beauty and depth. It is time. The following teachings were given to me directly from the elephants and the whales. These messages are what they wish us to know. May you open your consciousness and drink deeply of the unconditional love and wisdom of these tremendous beings. Dearest beloved human family, our kind is dying, as is yours. We are all in finite bodies, and it is only a matter of time until each one of us, individuals and species alike, will be finished here. Life will not always exist as we know it now. Change and growth are inevitable, and it is the knowledge that there is an end to this current reality that makes it seem so much more precious. What we would like you to hold for us and for ourselves as we live together on this planet, is the absolute knowing that all life is sacred, no matter what the form. And it is in this sacredness that respect, acknowledge, acceptance, compassion, and love are born. We share with you our perspective, not to convince you of anything, but to give you a new way of seeing that might stimulate you to find for yourselves the wisdom in all of creation. Every living being, every speck of sand, every river and rock has consciousness, and it is this consciousness, if you can be one with it, that will expose you to the deepest wisdom of your own heart and soul. And in the end, dearest ones, you will find out that we are all the same. Our love for you is great, and it is because of this love that we share with you our wisdom, accumulated over many hundreds of years of life on this planet, as well as knowledge gathered from the cosmos throughout the ages. Contained within our sharing is our hope that we can live harmoniously together in light, in gratitude, and with love for all. We sincerely thank you for sharing this wonderful adventure with us. My beloved friends of the human world, thank you for joining me and my kind in this way. We are delighted to be in your presence. Our message for you is very simple: slow down and listen to your heart. Your heart is connected with every other heart on this beautiful planet. We are all the same, at our core. We all have blood coursing through our veins and deep love in our hearts and souls. It is from this place that we will save one another from anything that might harm us. The earth is going through tremendous changes right now. We all are. The way to survive this in joy and lightness is to work together. Know us as conscious beings of love and light. Know yourselves as the same. And as we honor one another and ourselves in this way, we elevate the consciousness of an entire planet. We, as whales and as animals who share this home with you, honor you as human beings. We know who you are. We see your wisdom and creativity, and your compassion. We feel it and know it. The rest falls aside; all the angst and anger simply born of insecurity and disconnection. We can work with and help one another to restore our world to a place of harmony and peace. All it requires is openness, willingness, and allowing the divine to move through us. This we can do—and already are doing. We love you and thank you for your amazing spirit and love. Thank you for hearing us. Beloved humans, our brothers and sisters of the earth, for a very long time now, human beings and animals have shared the earth and have lived together, sometimes in harmony, and sometimes in conflict. In times of destruction and violence, all of us have been harmed, sometimes beyond repair. This needs to end. We can no longer tolerate, or even survive, the devastation that has resulted from the inharmonious and, at times, malicious intent. What we ask of you is simple: we ask you to slow down. We ask that you explore your hearts and pay attention to the messages of your bodies that are so attuned to universal forces and divine wisdom. Let yourselves get quiet and feel into the great knowing that you already have within you. It is from this place that you will sense and know the reality of which we speak: that all life is scared, that there is no hierarchy of souls, and that each living being has consciousness and awareness. You will know that everything that exists is part of one reality, with one mind and one heart at its source. There is no separation and no difference between us at the level of the soul. It is our deepest desire that someday we will work together, not as elephants, whales, and human beings, but as fellow souls, to create a new way of being on this beautiful planet earth. A way of honoring all life as sacred. A way of knowing one another, in the depths of our awareness, as one and the same. A way of protecting and cherishing every little fiber and molecule of life so that nothing is disturbed or destroyed needlessly. A way of loving so profoundly, so honestly, that nothing and no one ever need feel alone or ignored, and certainly not abused or exploited. We can all live in harmony. We can all nurture and support one another in a beautiful, elegant manner. This is not so far beyond our reach. All it requires is a willingness to open up to a world that is beyond what is now accepted by human consensus reality; an openness to accept some things on faith rather than relying solely on tangible, physical evidence, and ultimately, an allowance of the divine life force to penetrate our very essence and teach us things we cannot otherwise know. Thank you for giving us this opportunity to speak. We love you. We appreciate you. We acknowledge you. And we put great trust and faith in you to make this world a far better place than you can imagine in even your wildest dreams. And we will be here with you to share it all. Thank you.